Synthetic peptide within Human HNRPDL aa 214-244 (internal sequence) conjugated to Keyhole Limpet Haemocyanin (KLH). The exact sequence is proprietary. NP_112740.1. 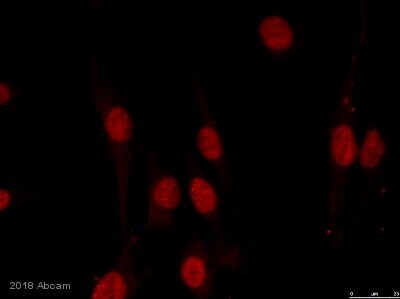 K562, HepG2 and Jurkat cell lysates. Our Abpromise guarantee covers the use of ab175067 in the following tested applications. WB 1/100 - 1/500. Predicted molecular weight: 46 kDa. Expressed in heart, brain, placenta, lung, liver, skeletal muscle, kidney, pancreas, spleen, thymus, prostate, testis, ovary, small intestine, colon and leukocytes. Expressed in myeloid leukemia, gastric adenocarcinoma, cervical carcinoma, hepatoma, fibrosarcoma, colon adenocarcinoma, epidermoid carcinoma, osteosarcoma and urinary bladder carcinoma cells. Dimethylation of Arg-408 is probably of the asymmetric type. Nucleus. Cytoplasm. Shuttles between the nucleus and the cytoplasm in a TNPO1-dependent manner. ab175067 has not yet been referenced specifically in any publications. Publishing research using ab175067? Please let us know so that we can cite the reference in this datasheet.